“I barely make ends meet. Every once in awhile I have to cut down on my food costs by quite a bit, Jonethan Brigley, one of the protesters and chair of the ACORN Dartmouth chapter, told the Nova Scotia Advocate. Brigley works in the fast food industry, and earns minimum wage. “What you do is go hungry, eat less during the day. It is extremely rough to live on minimum wage,” Brigley said.An information picket was held outside McDonald’s on Spring Garden Road this morning to remind passers by that minimum wage in Nova Scotia is not enough to live. The information picket was organized by The Fair Wage Coalition, a coalition of workers, students, and community members coming together to fight for a $15/hour minimum wage here in Nova Scotia. 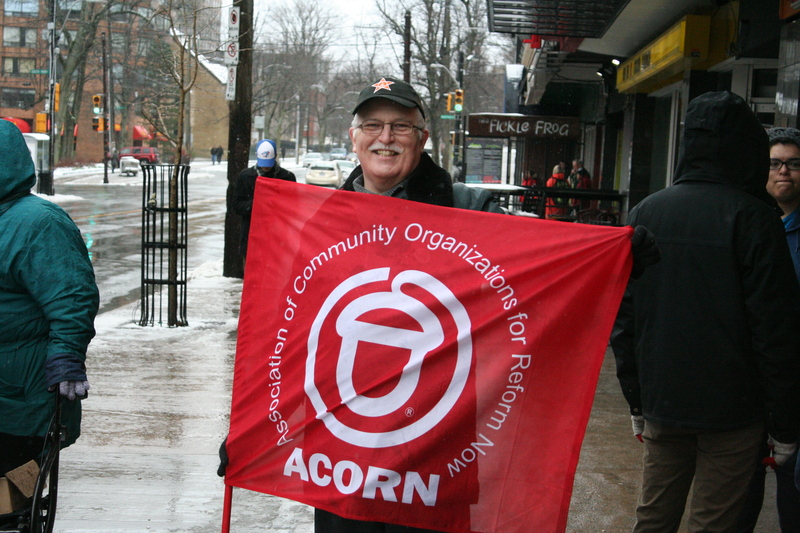 The group is composed of ACORN Nova Scotia, Solidarity Halifax, the Canadian Federation of Students, the Dalhousie Student Union, the Halifax-Dartmouth & District Labor Council, and the Nova Scotia Federation of Labour. 130,000 Nova Scotians struggle to make ends meet on less than $15 an hour. “A living wage in Nova Scotia is calculated to be $20,60. That would be enough to live truly comfortably,” said Brigley. “All studies show that an increased minimum wage either boosts the economy, because people spend more, or has a neutral impact, Hutton said. Similar rallies were held all across North America. Earlier this week newly elected NDP leader Gary Burrill talked about his party’s commitment to push for a $15 an hour minimum wage in Nova Scotia three years from now. But neither the governing Liberals nor the Progressive Conservatives are supportive.